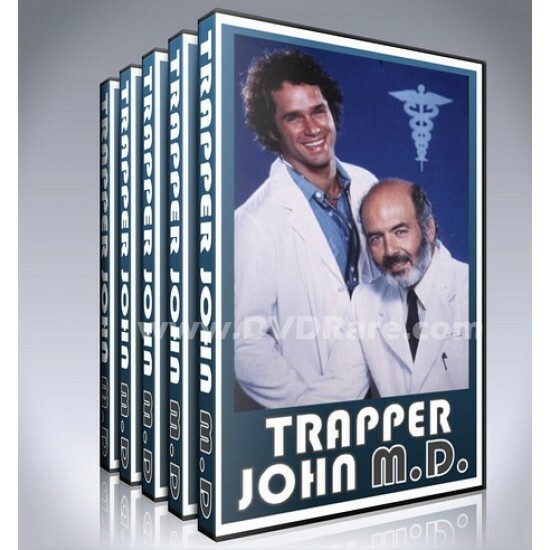 We are proud to present the classic 1980s TV show 'Trapper John, M.D.' on DVD. This DVD Set contains Seasons 1-7 of this legendary show, and it's exclusively available at DVDRare.com for a limited time only! Trapper John, M.D. is an American television medical drama and spin-off of the film MASH, concerning a lovable surgeon who became a mentor and father figure in San Francisco, California. The show ran on CBS from September 23, 1979, to September 4, 1986. Trapper John, M.D. focuses on Dr. "Trapper" John McIntyre (Pernell Roberts) 28 years after his discharge from the 4077th Mobile Army Surgical Hospital (M.A.S.H.) in the Korean War. In the nearly three decade interim, the character had mellowed considerably. He didn't just learn how to stop fighting the system but became a part of it, in a sense, as the Chief of Surgery at San Francisco Memorial Hospital. Trapper showed tremendous compassion toward his patients, often violating "established hospital procedures." Working with Trapper was an aspiring young professional named Dr. George Alonzo "Gonzo" Gates (Gregory Harrison). Gates had a lot in common with Trapper, as he had served in a M.A.S.H. during the Vietnam War. His sense of humor and love of life also reflected elements of Trapper's younger days. In the show, Gonzo resided in a motor home in the hospital parking lot. Pernell Roberts as Dr. "Trapper" John McIntyre, M.D. Gregory Harrison (1979–1985) as Dr. George Alonzo 'Gonzo' Gates, M.D. Charles Siebert as Dr. Stanley Riverside, III, M.D. Brian Stokes Mitchell as Dr. Justin 'Jackpot' Jackson, M.D. Timothy Busfield (1984–1986) as Dr. John 'J.T.' McIntyre, Jr., M.D. The set contains Seasons 1-7 of Trapper John, M.D, minus episode 16 from season 5, which was not archived by the production company. All other 149 episodes are included in the set and are exactly the same as they were shown on TV back in the day!